Alrighty, it’s been a long time since I’ve written up an actual beer friday post – though as my burgeoning belt line and pepperoni moobs will attest to it’s not for a lack of drinking new beers. Figure I’ll start this out with a recent one that sticks out in my mind, though not necessarily for a good reason. So I picked up the Chatoe Rogue Wet Hop while at the Rogue garage sale they had just after Christmas. Wasn’t actually looking for the Wet Hop, was actually hoping to pick up a case of the juniper pale, but that wasn’t to be had. The bright label called to me, and as the case price was a deal relative to the price of buying their 22’s seperate, figured what the hell and picked up a case. The beer pours hazy orange with a thin head. Medium body with the slighest aroma of hops and warm malts. An easy drinker (you can quaff it with ease), but the taste is far less than I anticipated, just a slightly malty/hoppy taste to it. Flavor opens up a bit as it warms, but to be honest there just isn’t much to this beer in my opinion, and left me a bit disappointed. 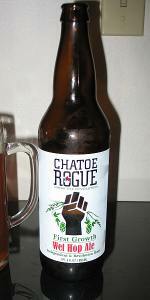 I expected a ‘brighter’ hop taste a la the wet hop ales Deschutes put out, but it wasn’t to be had from the Chatoe Rogue. Desirable? Not so much, especially if you have to pay the standard Rogue $6/22 oz. bottle. So there it is, beer friday. Go get outdoors this weekend and chase your trips with a beer. Oh, and if you’re in California I hate you right now! You’re getting dumped on while we get the shaft end of an El Nino season. Would be interested in what you think about the Pyramid winter beer being poured right now. I haven’t had a chance to get down there. How does it compare to Brr? Which one is it? Don’t know I’ve seen it.